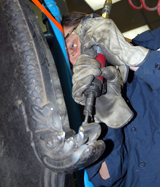 Behind each machine, there is a skilled group of individuals restoring them. We can think of no other industrial sector where one must have the skills of a machinist, the common sense of a millwright and the creativity of an artist. Each machine we undertake to restore starts with research. 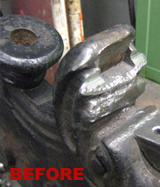 After which, the item is completely stripped and rebuilt. Almost all machines are either missing original items or have broken parts. 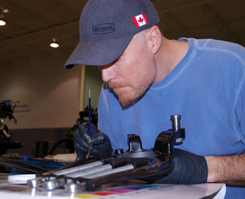 In HIW's full machine shop, it’s our job to repair and remanufacture parts where there are no drawings. 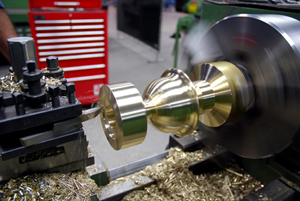 Everything from bed corners, friskets to finials and treadles, are made right in the Works. The restoration work at HIW requires more than technical aptitude, but also a whole lot of ingenuity in rebuilding components from scratch. Finishing and detailing are done by hand echoing the great skills and creativities of the artisans from centuries ago. 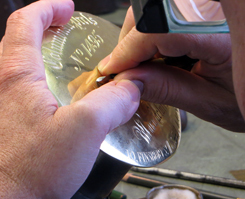 Processes include hand-engraving and hand-painting of intricate decorative features. The abilities of our people to research and reconstruct century-old machines set HIW apart from most historical museums. On completion, all machines become fully functioning and as exquisite just as the day they were made. HIW offers our restoration services to others, if requested, and will also complete machines that can be either purchased or leased for use or as beautiful displays. 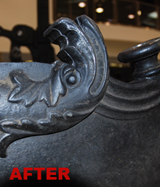 For inquiries about our restoration services, please contact: info@howardironworks.org. We are extremely excited with the commencement of the long-awaited work on our Cincinnati Type Foundry newspaper press. The work is expected to be extensive due to its complexity and current condition of the press. Another project to be tackled in the shop is the restoration of the Andreas Hamm's guillotine - dubbed as the "North America's Oldest Heidelberg". Andreas Hamm and his partner, Andreas Albert, founded what would become Heidelberg in 1850.